The double crochet stitch is one of the basic stitches that you will learn early on when you are first beginning to crochet. It is a great versatile stitch that can be used in a number of ways throughout the duration of your journey with crochet. This post shows you first how to make a double crochet stitch, then it shows you variations on double crochet and what you can do with the dc stitch. Even if you are a seasoned crocheter, you may be surprised to learn all of the things that you can do with this crochet stitch! You need to have something to work your double crochet stitches into (unless you choose a chainless foundation double crochet, which will be discussed later in this article). Therefore, you need to begin by crocheting a foundation chain. Start with a slip knot. See: How to crochet a slip knot. Next, crochet your chain. See: How to crochet chain stitch. If you are working with a crochet pattern, then the pattern will tell you how long your foundation chain should be. If you are not working with a pattern, you will crochet a chain that is as long as you want for your project, plus add another two stitches. So for example, let's say that you want to crochet a skinny scarf that is ten double crochet stitches across. Make a foundation chain that is 10 + 2 (or 12). The reason that you add the extra chains is because those will count as the first double crochet, which you will see in a moment. Yarn over the hook and then insert the hook into the chain. On this first stitch, you are going to insert the hook into the third chain from your hook. Those chains that you are skipping are what serve as your first double crochet of the row, although you probably won't be able to see this until you've completed the next stitch. That is the reason that you add those extra chains to the foundation chain as described above, though, because they help create the chains that become the first double crochet. For now, though, you can just trust that this is the way that you do it, so yarn over and insert the hook into the third chain from the hook. Yarn over again and then pull the yarn through that third chain from the hook where you inserted your hook. When you have completed this step, you should see three loops on your crochet hook. Yarn over again. Pull the yarn through the first two of the three loops on your hook. This will leave two loops on the hook at the end of this step. Yarn over one final time. Pull through both of the loops that are still on the hook. You have completed the double crochet stitch. Insert hook into the stitch where you want to place the dc stitch. Pull through the first two of three loops on hook. Pull through the remaining two loops on hook. That's all there is to it. Once you've completed the first double crochet stitch, you should see that it is standing to the right of what now appears to be another double crochet stitch; that's the stitch that was created when you skipped the first three chains because they serve as the first double crochet stitch of the first row. Note that where the instructions say "to the right" in this article is intended for right-handed crocheters. It will be the opposite for left-handed crocheters. You only need to skip those first three chains at the very beginning of the foundation row. After that, you don't need to skip chains. So, you'll repeat the same steps outlined above for your next double crochet, but you'll be inserting the hook into the next stitch that is immediately to the left of the existing double crochet hook. You will keep doing this, adding one double crochet stitch in each chain until the end of the row. As explained in step six, you don't need to skip any chains except at the very beginning of the foundation chain, to make that first double crochet of the project. However, each time that you turn the work and begin a new row, you do need to create a turning chain. It is similar in that you are making the first double crochet of the row without actually doing the steps of a double crochet stitch. To do this, you'll simply chain three. This will count as your first dc of that row. Then you will work the next double crochet by doing your yarn over and inserting the stitch into the next stitch. In This Variation of Double Crochet, Each Stitch Was Worked in Alternate Loops. The Resulting Fabric Has More Texture Than Plain Double Crochet Fabric Does. Photo © 2009 Amy Solovay, Licensed to About.com, Inc. The steps above outline how to crochet rows of double crochet stitches. However, there are many things you can adjust to create slightly different designs using the double crochet stitch. The most basic of these is that you can crochet your stitches into the front loops only or the back loops only of each row. This will create different textures, tension and ribbing options still using the same basic dc stitch. Take a look at what double crochet looks like when worked in different loops. 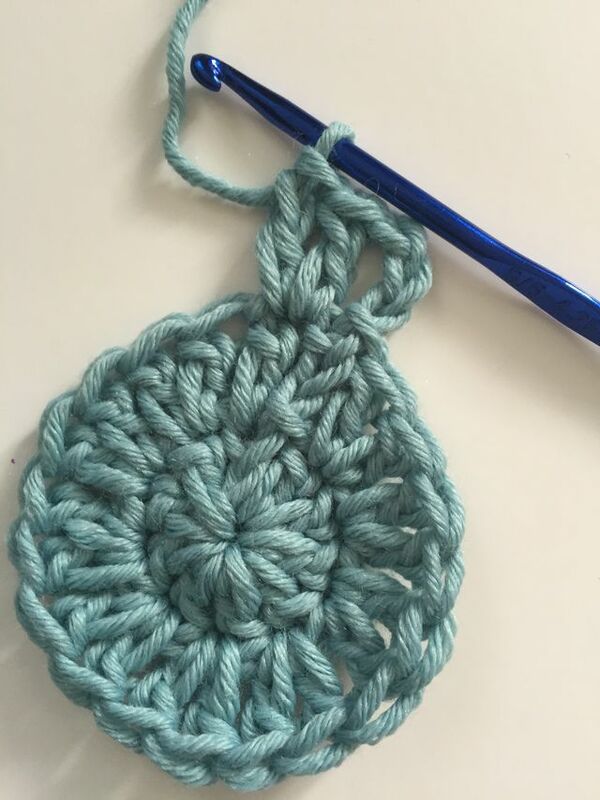 If you want to crochet items that aren't just square or rectangular then you are probably going to need to increase and decrease your stitches. When you increase double crochet, you simply crochet two double crochet stitches into one stitch from the row below it. Leave the work on the hook just like it is. Yarn over, insert the hook into the next stitch. Work as you normally would by doing yarn over, pull through, yarn over, pull through first two loops on hook, and yarn over one more time. There should be three loops on the hook. Yarn over and pull the yarn through all three loops. This secures the two side-by-side double crochet stitches with a common stitch at the top, effectively turning them into one double crochet stitch to work into in the next row. As alluded to in the first step of this guide, there is actually a way to begin your crochet work without actually making a foundation chain. You basically incorporate the foundation chain into the double crochet stitches in one step. This is a more advanced way of beginning crochet projects. Many people like chainless foundation stitches because they are more uniform than working into a chain. Interested in this option? Moogly offers a great video tutorial for chainless foundation double crochet. Crochet stitches are typically worked into the top of the stitches from the row below. However, they can also be worked around the posts. Double crochet post stitches are a very common option. They are often used for making cables as well as richly textured fabrics. You can do front post double crochet and back post double crochet and once you know how to do those you can do advanced techniques such as fpdc2tog. Insert your hook front-to-back through your work so that the post you want to crochet around a situation in "front" of your hook. Yarn over and pull through the first two of the three loops on the hook. Yarn over and pull through the remaining two loops on the hook. A back post double crochet would be worked the same way except that you would insert the hook from the back of the work into the front of the work around the post where you want to make the stitch. You can make many different types of items using basic double crochet stitches worked in the ways described above. The world really opens up to you once you learn double crochet, though, because so many of the best classic designs and favorite techniques are made using double crochet stitches. The Classic Crochet Granny Square. Each cluster in a granny square is made up of three double crochet stitches. The only other things you need to know for this are how to crochet chains and work in the round. Other Granny Crochet Shapes. The double crochet is used to make granny circles, granny triangles and granny rectangles as well. Filet Crochet. This terrific niche of crochet allows you to make letters and other great graphics in patterns that can range from early vintage designs to the most contemporary patterns. It is made using double crochet stitches and chain spaces. V-Stitch. The v-stitch is another crochet pattern that uses a combination of double crochet stitches and crochet chains. The placement of the stitches and chains creates "V" shapes. This is a really popular 21st-century pattern option. Crossed Double Crochet. Whereas the v-stitch makes a pattern that looks like a v, the crossed double crochet (xdc) looks like x's. It's a great simple way to create a crochet fabric that looks more difficult than it really is to execute. Cluster Stitch. Clusters, bobbles and popcorn stitches can be worked using different basic stitches but it is very common to use the double crochet stitch. Crochet Shell Stitch. Likewise, the shell stitch can be made in different heights but the double crochet shell stitch is most common. V-Stitch Crochet Shell. This combines the dc v-stitch with the dc shell stitch. Simple Mandala. Crochet mandalas can be made using many, many different types of stitches. However a simple favorite - the standard 12 round crochet mandala pattern by A Creative Being - relies entirely on double crochet stitches.